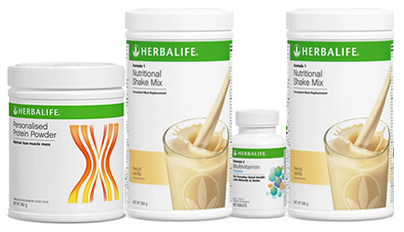 Every Herbalife programme includes Formula 1 Nutritional Shake Mix which contains protein. However this programme includes additional protein to assist with hunger management. Protein is a good energy source as it takes longer to digest than carbohydrates and so doesn't create a blood sugar spike with a resultant increase in insulin production. It also keeps a person satisfied for longer. Eating the right amount of protein helps to maintain lean body mass (LBM) as you lose weight. The more LBM you have, the faster your metabolism and the more rapidly you burn calories and stored fat. Having a higher percentage of muscle (and lower percentage of fat) in the body will make it much easier to keep that weight off into the future. Additionally, a higher protein intake actually increases levels of the appetite-reducing hormones, while reducing your levels of the hunger hormone, ghrelin. By replacing carbs and fat with protein, you reduce the hunger hormone and boost several satiety hormones. As with all Herbalife programmes, this programme is based on replacing 2 meals with healthy high protein shakes, reinforced with additional protein. The third meal, which can be lunch or dinner, should be a healthy meal which includes protein and vegetables. Multivitamin Complex helps to support the body. The function of each product is described fully below. This programmes comes standard with 2 canisters of Formula 1 which will ensure your full month supply of product. If you do wish to have 2 different flavours of Formula 1, please note this in the comments field on the checkout page. This is a 100% protein powder that contains no carbohydrates and no sugar. It is a mixture of soy and whey protein formulated to have the correct mix to ensure you don't get hungry. At 20 years old, 162cm tall and 62kg heavy, I spent the past year unhappy with my weight and disappointed by failed weight-loss attempts. After spending nine weeks on the Herbalife program I have lost 4kg and 23cm (which equates to 8kg of fat). The program has not only helped me to lose those stubborn kilos that I had struggled with for months before, but has allowed me to become far more confident in myself.